Rotherham United beat Bolton with four second-half goals to pile more misery on the Championship's bottom club. A tight first half saw Zach Clough go close for Bolton and Danny Ward had a similar effort for the hosts. 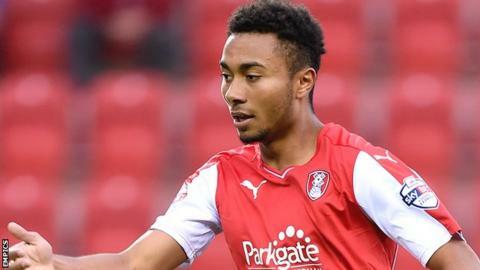 Grant Ward put Rotherham ahead with a half-volley from the edge of the box, while Danny Ward rounded Ben Amos to score against his former club. Joe Newell scored from a tight angle and Jonson Clarke-Harris slotted into the bottom corner to complete the win. The victory was enough to lift the Millers out of the Championship relegation zone, while Bolton's winless run in the league was extended to 17 matches. Bolton had the game's first chance as Emile Heskey released Clough, whose close-range shot was superbly saved by Lee Camp, but Rotherham asserted their authority as the half went on and went close three times in a matter of minutes. Newell's inswinging strike was palmed over by Amos, Kirk Broadfoot put his header over the bar, while Amos saved from Danny Ward at close range. An injury to Bolton's former England striker Heskey saw him substituted at the start of the second half and his replacement Gary Madine caused trouble straight away with a clever flick. The home side went in front from a well-worked corner as Tony Andreu set up Ward to fire in a half-volley through the body of Amos. Bolton, without a win since 12 September, never let their heads drop and Liam Feeney's back-post header went just wide. Amos produced a stunning save to keep the deficit down as he clawed away Broadfoot's effort, but could do nothing to stop Ward, who had been sent clear by Newell. Newell then powered in behind the Bolton defence to make it three and substitute Clarke-Harris latched onto Andreu's clever backheel to wrap up a second win in as many matches. Rotherham boss Neil Redfearn: "There was a lot at stake for both sides and I thought we were the better side. "I thought in the second half, it really opened up, it became stretched and that suited us. "Four wins in seven is definitely play-off form, but we are in the position we are in. We have got to keep doing what we are doing and keep putting little runs together." Bolton manager Neil Lennon: "It's not been good enough, we're bottom of the league and we're in danger of being stranded. "I have seen it too many times now away from home now - as soon as we concede we seem to drop our heads, stop competing all together and we made it too easy for Rotherham to score. "I want to try to turn things around, I don't want to quit, I don't want to resign, I want to turn things around, but that may be taken out of my hands." Match ends, Rotherham United 4, Bolton Wanderers 0. Second Half ends, Rotherham United 4, Bolton Wanderers 0. Corner, Rotherham United. Conceded by Ben Amos. Substitution, Rotherham United. Paul Green replaces Joe Newell. Corner, Bolton Wanderers. Conceded by Joe Mattock. Attempt saved. Zach Clough (Bolton Wanderers) right footed shot from the left side of the box is saved in the centre of the goal. Assisted by Dean Moxey. Attempt saved. Jonson Clarke-Harris (Rotherham United) left footed shot from a difficult angle on the left is saved in the centre of the goal. Assisted by Tony Andreu. Attempt missed. Zach Clough (Bolton Wanderers) right footed shot from outside the box is too high from a direct free kick. Goal! Rotherham United 4, Bolton Wanderers 0. Jonson Clarke-Harris (Rotherham United) left footed shot from the left side of the box to the bottom left corner. Assisted by Tony Andreu with a through ball. Attempt missed. Tony Andreu (Rotherham United) right footed shot from outside the box is high and wide to the left. Assisted by Lee Frecklington. Goal! Rotherham United 3, Bolton Wanderers 0. Joe Newell (Rotherham United) left footed shot from the left side of the box to the centre of the goal. Assisted by Tony Andreu. Attempt missed. Gary Madine (Bolton Wanderers) header from very close range is too high. Assisted by Liam Feeney with a cross. Attempt blocked. Dean Moxey (Bolton Wanderers) left footed shot from outside the box is blocked. Assisted by Wellington. Attempt saved. Joe Mattock (Rotherham United) left footed shot from the centre of the box is saved in the centre of the goal. Corner, Rotherham United. Conceded by Rob Holding. Attempt blocked. Grant Ward (Rotherham United) left footed shot from the right side of the box is blocked. Assisted by Lee Frecklington. Grant Ward (Rotherham United) is shown the yellow card for a bad foul. Rob Holding (Bolton Wanderers) is shown the yellow card for a bad foul. Goal! Rotherham United 2, Bolton Wanderers 0. Danny Ward (Rotherham United) left footed shot from a difficult angle on the left to the bottom left corner. Assisted by Richard Smallwood with a through ball. Corner, Rotherham United. Conceded by Dorian Dervite. Attempt saved. Kirk Broadfoot (Rotherham United) header from very close range is saved in the centre of the goal. Assisted by Joe Newell with a cross.